Have a friend that would love our service? Refer them to us and both get $50 off your next bill. T&C's apply. These regional and remote towns are lit up and we're extending our network reach even further. With Just Wireless and Just Fibre available in Moree and Just Wireless available in all other locations many residents and businesses now have real options for fast affordable internet. Narrabrai | Gunnedah | Tambo and more COMING SOON!!! Work is progressing at a fast pace, extending our network further into regional and remote Australia. Keep your eyes peeled and on our Facebook page! Register your interest! Our regional and rural communities are the backbone of Australia. We’re working directly with Councils and communities alike; building networks to help our businesses and families grow, stronger, together. Almost half of regional Australians describe their internet as very poor or inadequate. We want to change that. All Australians deserve quality internet. Join the JustISP community; ask us how to get your community connected to ours. We base our staff in the regions that we service, we live here, we work here and we are committed to giving you great service. Want to get connected to the world? We can help. Check out our plans to connect your home to the JustISP community today. Want to compete on the world stage? Our business plans aren’t like other business plans. We listen and give you what you need. Feel like you’ve been left out in the cold? Let us give you a warm welcome into the JustISP community with our innovative ideas and tech. We understand the pain Australians are feeling, we’ve been feeling it too. That’s why we started JustISP…to bring fast, reliable and affordable broadband to where Australians live, to where you live. We don’t all live in the east-coast metropolitan corridor; many of us live and work in towns, big and small, and in remote rural areas. They’re our homes, our communities…but that doesn’t mean we should have to accept sub-standard access to the rest of the world. 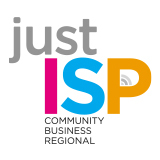 JustISP is working with communities to bring high-speed Internet to you; to your community; to where you live; where we live. Sick of complaining about lack of speed, or exceeding ridiculously small data download caps? Is your ISP constantly pointing the finger at the infrastructure provider, and the infrastructure provider pointing it right back…leaving you stuck in the middle, with no where to turn. JustISP is here to help. We want to help. Reach out to us and we’ll put our brains to task, working out the best way to get you what you need.